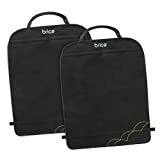 Brica Deluxe Kick Mats (2 pk) You may not be able to keep your little ones from kicking the back seat, but you can keep their dirty feet from ruining your car’s upholstery with these Deluxe Kick Mats. The Grime Guard fabric is easy to clean and protects against the inevitable water and dirt that comes with active kids. At ten percent larger than our previous model, you can be sure that your seats get maximum coverage and protection. Your errands, trips and travels just go more smoothly when you can relax knowing your seats are protected from restless little feet. You may not be able to keep your little ones from kicking the back seat, but you can keep their dirty feet from ruining your car’s upholstery with these Deluxe Kick Mats. The Grime Guard fabric is easy to clean and protects against the inevitable water and dirt that comes with active kids. At ten percent larger than our previous model, you can be sure that your seats get maximum coverage and protection. Your errands, trips and travels just go more smoothly when you can relax knowing your seats are protected from restless little feet.